Bulls have been worshipped since ancient times as symbols of strength and fertility. Taurus is rich in maidens...the Hyades and the Pleiades are all daughters of Atlas. The Greeks saw the stars of Taurus as Zeus in the guise of a bull. One day, Zeus spotted the beautiful maiden, Europa, as she played by the seashore with a group of girls. To seduce her, he decided to change himself into a bull. Not just any bull, mind you, but a beautiful white bull with magnificent rippling muscles and golden horns. Zeus mixed himself in with her father's royal herd as they grazed nearby. When Europa caught sight of him, she could not resist such beauty. She approached this splendid animal and was amazed at how gentle and friendly it was. The bull knelt down and Europa climbed onto its back. As soon as she did, the beautiful bull sprang to its feet and ran into the sea. He swam with her to the island of Crete. There, he changed back into his true form and she became his mistress. Europa bore him three sons, one of whom was Minos, who later became the king of Crete and father of the monstrous Minotaur. When planets move into the sign of Taurus, their energies are slowed down, some even to the point of feeling like they are plodding along. Because Taurus is a Fixed Earth sign, we become very attached to our possessions and our routines. We don't want to change anything. It's not a time when we feel like taking risks. Some planets are very compatible with this idea, but others cause us to feel extremely confined and agitated by the idea. Taurus is the second sign and is therefore associated with the second house where earning and spending money are paramount. 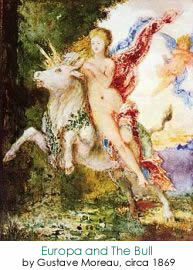 Taurus is one of two signs (the other being Libra) that are ruled by Venus, goddess of love and beauty. This association is a clue that what you tend to spend your mone on has to be beautiful, elegant, and probably expensive. The earthiness of this sign bears tremendous physical strength, and that can help us to get the hard work done that we seem to be drawn to. 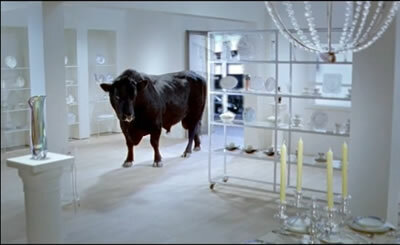 And like the earth, it is slow to anger, but when the earth quakes, watch out for the 'bull in the china shop'. An overabundance of this energy can make us feel stubborn, jealous, and extremely possessive. It can be difficult to share anything that you consider to be yours. Try not to fall into that trap. It's better to focus on being patient and dependable. One of the easiest constellations to see, Taurus lies just northwest of Orion. It contains two of the largest visible star clusters, the Hyades and the Pleiades. Taurus is the Latin word for Bull. 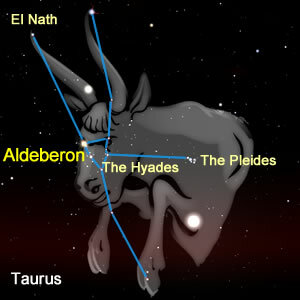 The stars of the Hyades cluster form the V-shaped face of the Bull and lie behind the star Aldebaran, which marks the 'eye' of the Bull. The star El Nath points out the tip of the northern horn , and the zeta star of the constellation lies at the tip of the southern horn. The Pleiades define the shoulder. Taurus is one of the oldest constellations, having been associated with a bull for over 5000 years. From approximately 4000 - 1700 BC, Taurus marked the vernal equinox. You can see it in the northern sky from November to March.